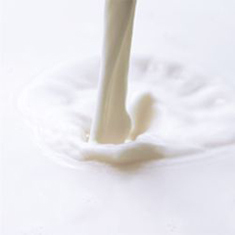 We monitor very specifically feeding and breeding conditions in order that milk we collect best meets our requirements. So we guarantee a quality as gustatory than health throughout the year. For 35 years, we make every day of the year a collection of milk in the morning in three herds selected for the quality of their production. The traditional cheese factory of The Revaliere based its reputation on the quality of its products. 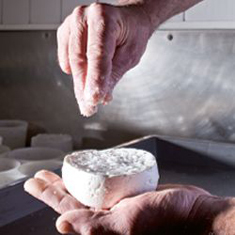 The use of home ferment, the lactoserum, guarantees character cheeses. Their mould rind, their grain and their flavors are the natural expression. It is not a move that is not controlled in the design of our cheeses. We respect an unique know-how where accuracy and the human hand can not be replaced. Thus the molding, the salting, the ashing and the driving in ripening are entirely manual operations. 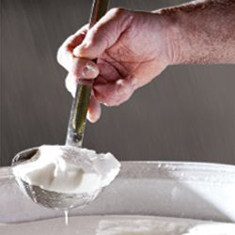 72 hours after being brought into cottage cheese, the cheese is removed from the mold by hand and laid on a cloth. 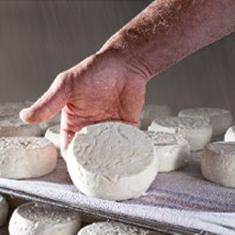 This wiping of a few hours allows the drying and ripening in more delicate environments. 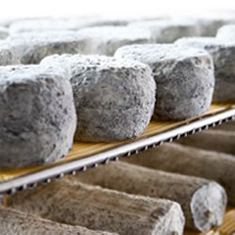 A few days in a dryer to regulate their hygrometry, cheeses must flourish and reveal all their secrets. 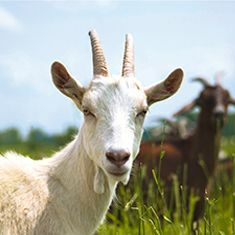 Ending their maturation in the maturing cellar at a controlled temperature, they will over time offer their best dresses and adorn of their best fragrances.